I noticed quite a few hits in the past couple of days from people looking for my Visio knitting symbol stencils (templates). They’re the tools I use to do all of the charts here on String. However those files appear to have gone astray. I’m having problems going back and editing the original posts to edit the links there, so I am offering up this set of links instead. I’ve got two sets, both for older versions of Visio. For Visio 5 here’s a Zip file containing the basic shape set, increases and decreases, and cables. And here’s the same thing for Visio 2000. I know for a fact that my stencils work with Visio 5, Visio 2000 and the last version of Visio in MS Office 2003. I haven’t had an opportunity to test the latest Visa version of Visio with my templates yet. Here’s a link to the original post describing my method, but in short – I’ve built a series of “alphabet blocks” each bearing a standard knit symbol. I build my patterns up block by block. I can group or rotate blocks as needed. Once my blocks are in order, I add chart notations, including my grids and row numbering, and a key. I can also use the same system for colorwork charting by assigning my desired colors either to the whole block, or to a small square unit in a block’s center, as needed. I offer up these stencils to anyone who wants to use them. For the record, I’ve heard that these blocks can be imported and used in other less expensive graphics programs including Edraw. I know that Edraw can open Visio files, but I don’t know if it uses a stencil or template library that can import Visio stencils. I suspect that to adapt my symbols you’d take one of the files in the zip dowloads above, then use Edraw to open it and copy the symbols out. If you do use my files to create your own charts, I’d greatly appreciate a link back or a line of acknowledgment in your final work. I hope that someone else finds these useful as I do. Very generous of you to share these. I use Visio myself for entrelac patterns (very abstract diagrams of 3-d entrelac shapes.) 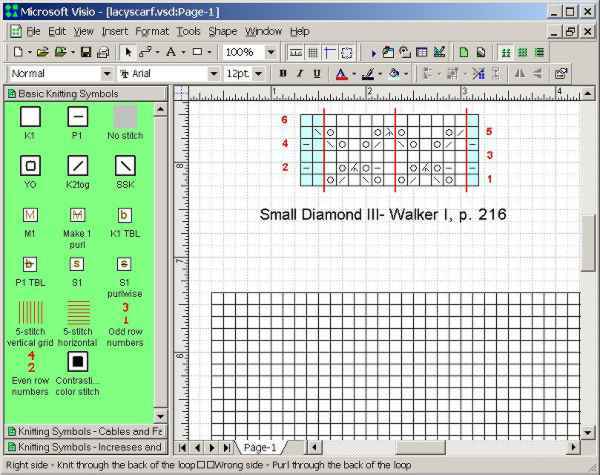 For regular knitting charts I use a CAD program, since I’m mostly based on Mac OS X. Thanks so much!